After a year and a half of meetings, brainstorming, delays, lacks of contents, changes and all sorts of exciting situations our collaboration with Secot has produced a useful and informative site in both Spanish and Catalan languages. This site is aimed to will serve as a tool for information, fundraising, recruiting and social presence for this organisation in Catalonia. The commited collaboration of Toni Calatayud ex-CEO for Walter Thompson Spain and Ramon Prats, made possible a bridge between an organisation with more than 200 members and our creative team at Algo Bueno Studio to materialize their needs and requests. 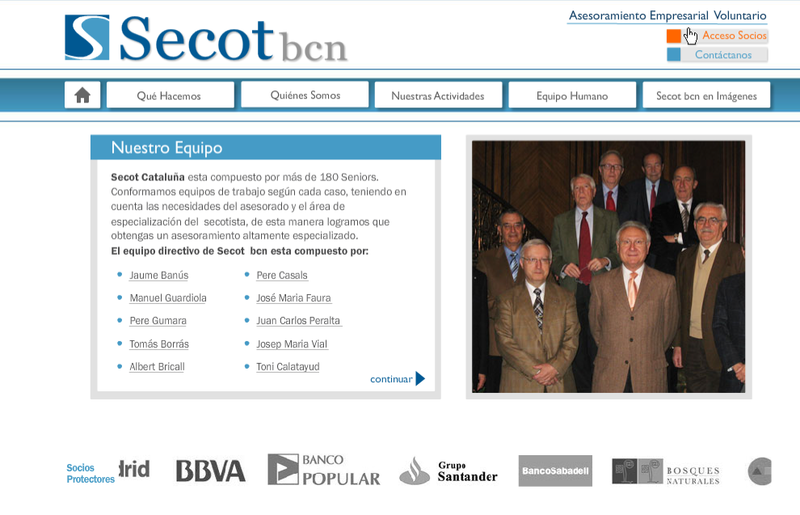 Secot is a non profit organisation with headquarters at the Barcelona Chamber of Commerce that offer support to entrepreneurs, small companies and government. their team counts with most of the CEO´s and VP of multinational companies and big national corporations that have recently retired and wish to stay active in business givng back to community, after years of company service. So this guys know a lot and have a lot to say together. During this year we have learnt slow cook taste better and even when sometimes fast times are on top of us, well done things are more rewarding than fast-food-like projects. This organisation has taken the time to discuss, test, rethink and evaluate all processes in a way that only a really experienced executives can possibly think today. Thanks for showing us the taste of a well cooked project in fast food times.